With the help of LilyPad Applications’ new Mobile Warehouse product, Fishbowl customers can now scan 2D barcodes rather than just 1D barcodes. This is a big deal because it lets you do much more with your barcode scanners in a shorter amount of time. You can scan a single barcode and populate dozens of fields in Fishbowl at the same time. To understand how this works, let’s first talk about the difference between 1D and 2D barcodes. Each 1D barcode is connected to a specific file in Fishbowl’s database, and scanning it allows you to gain access to the data in that file. UPCs and other similar barcodes are generally rectangular in shape and made up of a number of white and black lines along with various numbers and/or letters on the top or bottom. 2D barcodes, on the other hand, are often smaller and contain all sorts of nonlinear designs, such as pixels, dots, and squares. Think of QR codes. Those are 2D barcodes, and they are scanned not just horizontally but vertically, as well. Thus, they can contain geometrically more information than standard 1D barcodes. 1D barcodes can be scanned with a laser scanner while 2D barcodes can only be read by using a device that takes a picture of them and treats them as an image, not just a string of code. Luckily, most smartphones and tablets work well in this capacity. Let’s return to LilyPad Mobile Warehouse. As noted earlier, this solution gives Fishbowl customers the ability to create, map, and scan 2D barcodes. “Now, an electronics distributor can pull in 100 serial numbers off a case of product, or a food packager can pull part number, price, lot number, and expiration date, all from a single scan,” said Sal Cucinella, CEO of LilyPad Applications. To learn more about LilyPad’s 2D barcode functionality, click the link and watch the informative videos on LilyPad’s website. 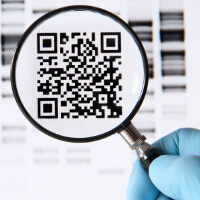 Need an easy way to create barcodes? Click here to access our Free Barcode Generator.